New genetic tools have identified links between early establishment traits and biomass yield in Miscanthus. This marker-assisted selection technique could save years of waiting for Miscanthus plants to establish and become mature. The technique can be used to reliably select higher-yielding plants earlier in the Miscanthus life cycle. URBANA, Ill. – The U.S. government has mandated a rise in domestic ethanol production from cellulosic bioenergy crops, spurring research to identify and improve high-yielding biomass crops. 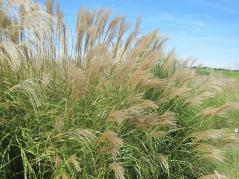 One of the strongest contenders is Miscanthus, a large Asian perennial grass. Several species and hybrids have proven to produce substantially greater biomass yields than switchgrass and other energy crops. However, Miscanthus crops can take from three to four years to establish before yields become reliable. A recent University of Illinois study used genetic markers to identify early developmental traits that correlate with future yield, potentially saving farmers and researchers years of time and effort. The researchers measured developmental and biomass traits over a period of three establishment years in the offspring of a cross between Miscanthus sinensis cultivars ‘Grosse Fontaine’ and ‘Undine.’ They then extracted DNA from the plants and examined the resulting single nucleotide polymorphisms, or SNPs, to develop a genetic map. The technique improves upon older types of genetic markers that were not as tightly linked to particular genes controlling important biomass traits. “It represents one of the very first maps that was made and it’s also one of the first times we were able to map a number of genes associated with biomass productivity, and determine the locations of those genes in the Miscanthus genome,” says U of I geneticist Jack Juvik. On a practical level, the researchers saw strong positive correlations between biomass yield and plant basal circumference, height, and tiller (stem) number, suggesting that plants that are able to grow taller and produce more tillers in the first few years may achieve higher yields in the long term. Furthermore, there were negative correlations between flowering time and yield, with early flowering individuals producing less biomass. Breeders could make use of that information to improve early selection of plants with enhanced biomass productivity to accelerate the breeding program. In addition to saving time and providing breeders with specific traits to look for in high-yielding plants, the techniques used in the study and the initial results establish a jumping-off point for future work. The paper, “Mapping the genome of Miscanthus sinensis for QTL associated with biomass productivity,” appears in GCB Bioenergy. The lead author was Justin Gifford, with additional U of I co-authors Juvik, Won Byoung Chae, Kankshita Swaminathan, and Stephen Moose. Funding was provided by the Consortium for Plant Biotechnology Research, the U.S. Department of Energy, and the Energy Biosciences Institute Feedstock Genomics Program. The article is available online at http://onlinelibrary.wiley.com/doi/10.1111/gcbb.12201/abstract.